We movie buffs are inundated with lists of best films. And, we’ve just run across a new one. The British Film Institute of 50 Films to see before the age of 14! Strange designation. Why 14? Oh, well, onward. We’ll only concern ourselves with classics from the 20s, 30s and 40s. Two silent films make the list. The famous short from France, Le Voyage dans la Lune (A Trip to the Moon), and 1921’s Charlie Chaplin classic — The Kid. No question in our minds that Chaplin’s best work was in silent pictures. By the early Twenties, the time of The Kid, the master has cemented his screen image of the ‘little man’ who survives against great odds. As British author/film critic David Thomson put it: As an actor/performer who has impinged on the world’s huddling round the idea of the oppressed little man, Chaplin may be the most famous image of the twentieth century. Be that as it may, Chaplin had help in The Kid. In the title role was a verrry young Jackie Coogan. The turn with Chaplin in The Kid made his early career fortune. Chaplin as the Tramp finds himself caring for an abandoned child (again, Coogan). The masterful tear-jerker was a hit. Coogan was thus in line to become perhaps the most famous child actor of that time. During the Twenties, the roles kept coming and so did the money. The story of Coogan and all that money is fodder for another blog. Enough said that he emerged as one of the more influential child stars in movie history. And speaking of history, the above French-made film, released (hold your hat!) in 1902, is perhaps the first big blockbuster in movie history. 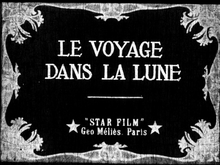 Created by Georges Melies, it’s about a group of astronomer’s adventure to the moon. The production values and, yes, special effects are astonishing, and have influenced filmmakers for decades. At any age, Le Voyage is worth the journey. We’ve talked about this before, but LISTS of what films to see is as meaningless as what films are BEST! People are so programmed now, that if it’s not “trending now” or “popular” on Netflix, or if “social media” hasn’t gone ‘viral’ with some obscure list, then they don’t want to know. With regards to the silent era of HOLLYWOOD, any list is preaching to the converted, as they already know what films are “must see’s” and worthy of attention. “The Academy’s decision to present four categories — cinematography, film editing, makeup and hairstyling and live-action shorts — during commercial breaks on this year’s Oscar show has been greeted with widespread outrage, with the condemnation stretching from Oscar watchers to past Oscar winners Guillermo del Toro and Emmanuel Lubezki. So… Not even HOLLYWOOD cares about LISTS, or the very crafts that help make movies worthy enough to be listed! It’s all product as far as HOLLYWOOD is concerned, and remember the Oscars are a TV show first and foremost, any class and honor they once had is long gone… Specially with a worldwide audience that is texting and tweeting each other. Agreed, Graham. And John Bailey is a fine cinematographer. If ever there were an issue that should lead to a resignation on principle, this might be it. The Academy has traditionally been SO stuffy about everything, it nearly choked on the notion of its “prestige.” It has gone from near-irrelevance on the “old school” side, to near-irrelevance trying to keep up with the dangerously narcissistic, zero-attention-span world in which we live. It’s rather like me trying to keep up with my three-year-old grandson in the park. He drives the agenda, as he should, but I sometimes need to pray he runs in the direction of the fence instead of toward the gate to freedom, and danger. Fences are sometimes, if not often, there for a reason.